Oceans of Fun Seal/Sea Lion Show, sponsored by Anderson Seal, LLC, is proud to announce the birth of its newest member, a male California sea lion, born March 6. 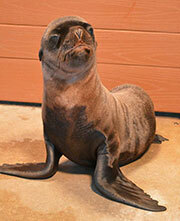 The pup, named Zeus, was born to mother Sonoma, and was healthy and strong at birth, weighing 18 pounds. The pup started nursing within a few hours, and is growing quickly. As of March 16, he weighed a healthy 25 pounds. Sonoma gave birth two years ago to a female, Talise, and as a first-time mother, she struggled with nurturing her pup. The Oceans of Fun staff worked diligently at establishing her mothering skills. Staff are thrilled their work has paid off, and that Sonoma has transferred the skills she was taught into learned behaviors. Nursing, protection, calling and patience are now all in place, and both Sonoma and Zeus are developing a strong bond with one another. This birth is significant for a number of reasons, including it representing the preservation of this species, as there’s an aging population of captive California sea lions in the U.S. Also, it marks an important collaborative effort between zoos and aquariums throughout the country, as Zeus will eventually move on to the Brookfield Zoo in Illinois to breed with that organization’s captive sea lion population. Zoos and aquariums do not work independently of each other, but rather, in conjunction with one another for species conservation – making sure animals are placed in the best facilities for propagation and genetic diversity. 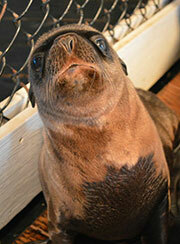 At birth, California sea lions are unable to swim. The skill set develops around 2 to 3 weeks of age. 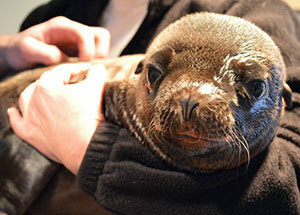 Over the next few weeks, the Oceans of Fun staff will assist Sonoma in teaching the young pup to swim. Zoo visitors will be able to see the pup when he makes his debut in the Oceans of Fun shows most likely by Memorial Day.